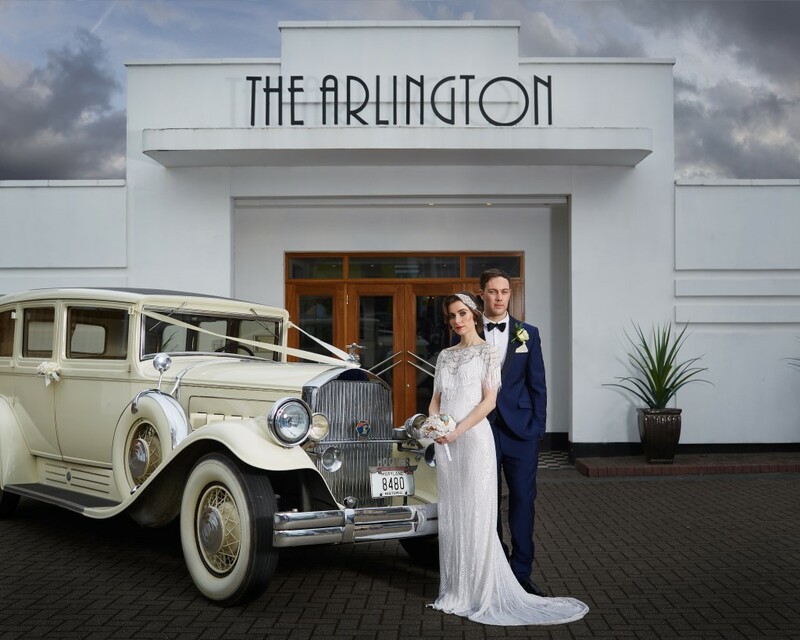 Today I am thrilled to share this stunning Art Deco Inspired bridal shoot at The Arlington with a hint of Gatsby. 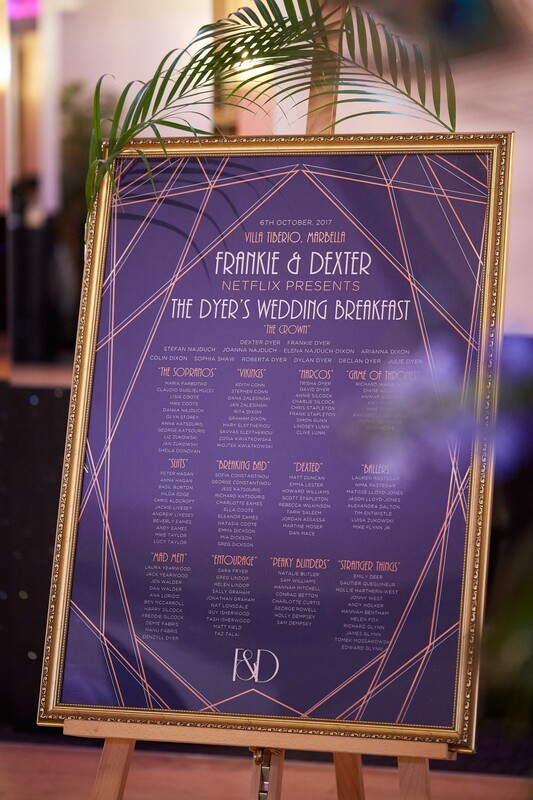 Images were captured by MD Harrison with co-ordination by Bridal Hair By Jennie. This shoot was the product of a real flash of inspiration. 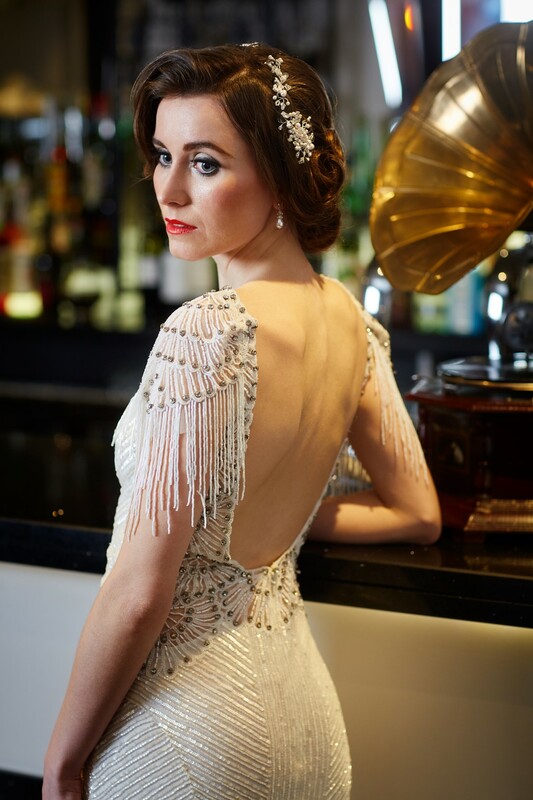 I was working at a wedding fair at The Lawn in Southend, styling the models’ hair. It wasn’t the warmest of days, and one of the girls was bundled up in a hoodie while having her hair and makeup done. 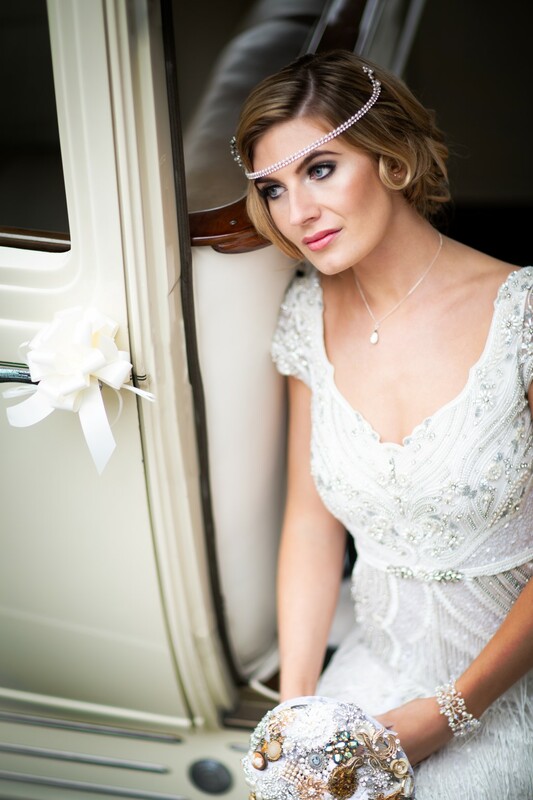 When she reappeared in her dress (a beautiful beaded creation by Eliza Jane Howell) everyone’s jaws dropped. 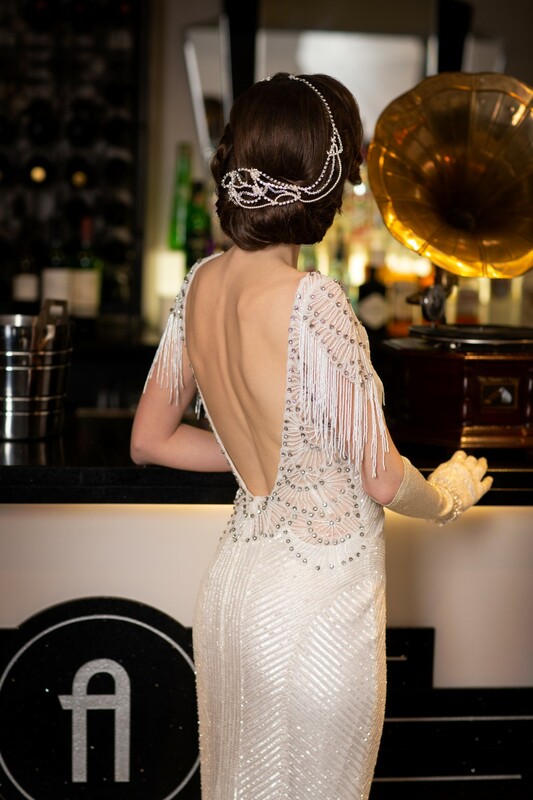 She looked incredible – like she should be attending one of Jay Gatsby’s fabled parties – and as she posed next to one of the vintage cars at the fair, I immediately pictured her surrounded by stunning 1920s inspired details. I knew I had to plan a shoot to bring this vision to life! 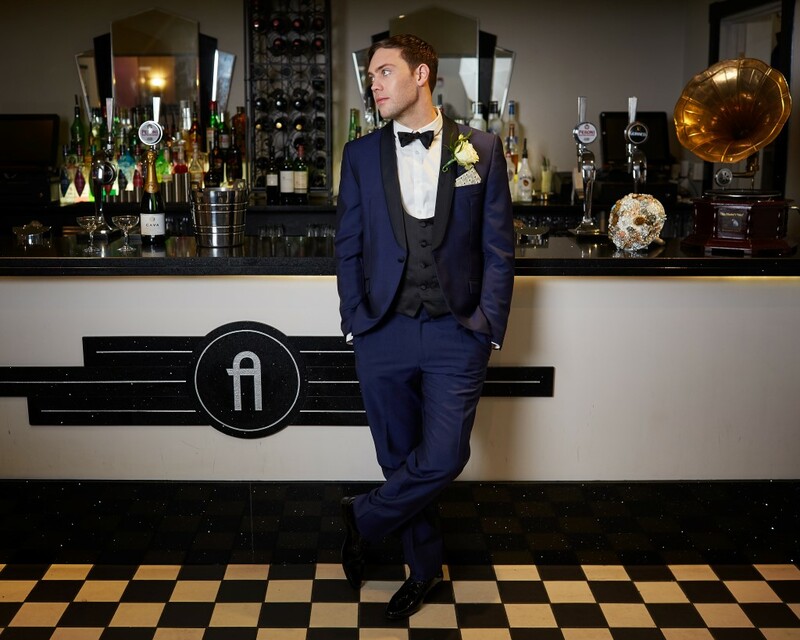 The Arlington Ballroom in Leigh on Sea provided the perfect backdrop, and I set about sourcing a team of suppliers to help me create the look I wanted. 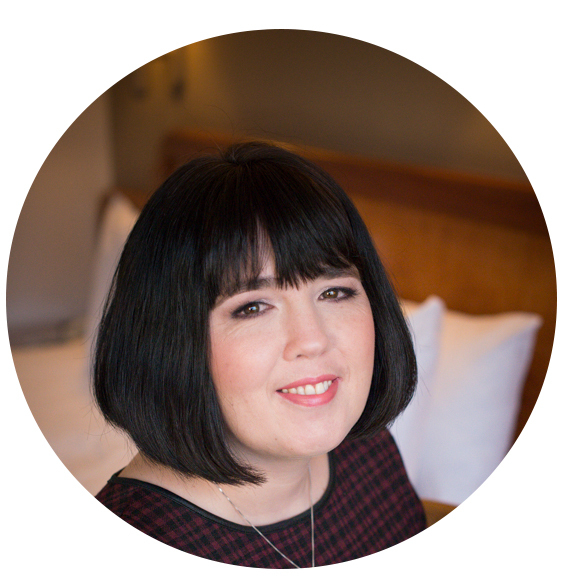 I’m based in Essex, and sometimes feel frustrated by the stereotypes that are often used in relation to this lovely county. 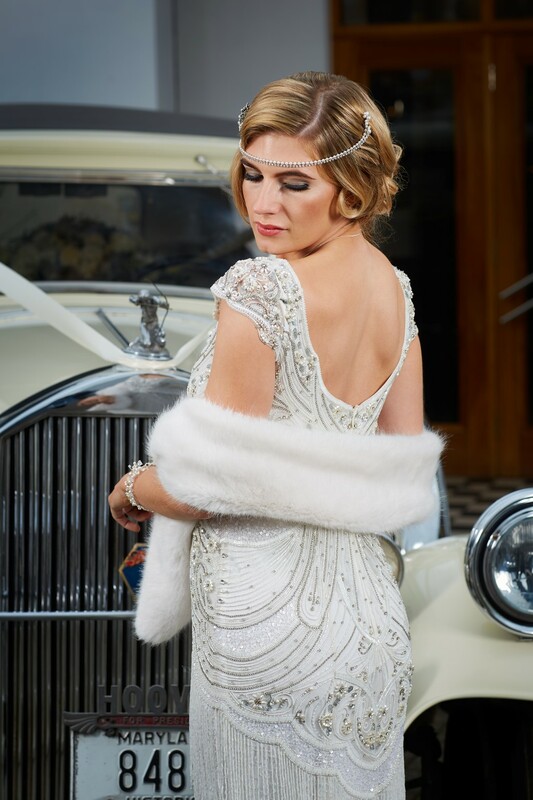 I decided to use only local suppliers for this shoot, to show what Essex is really made of! 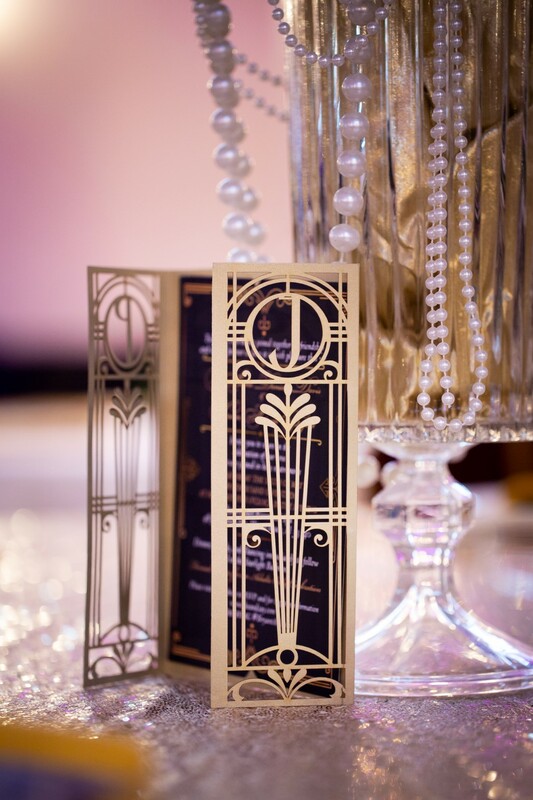 The end result was a refined and elegant 1920s look, without a hint of TOWIE in sight. 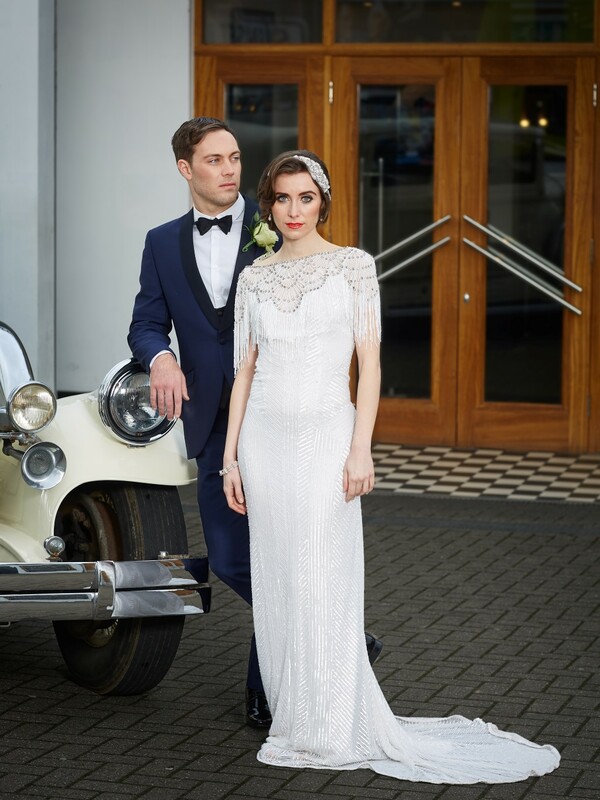 Blush Bride in Leigh provided us with not one but four gorgeous dresses by Eliza Jane Howell. 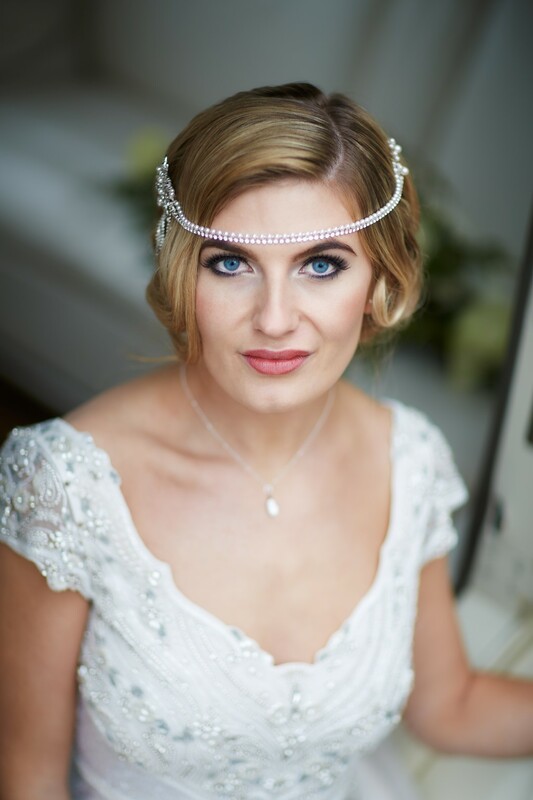 I love her whole collection – it just oozes glamour and sophistication, and our two bridal models looked stunning on the day! 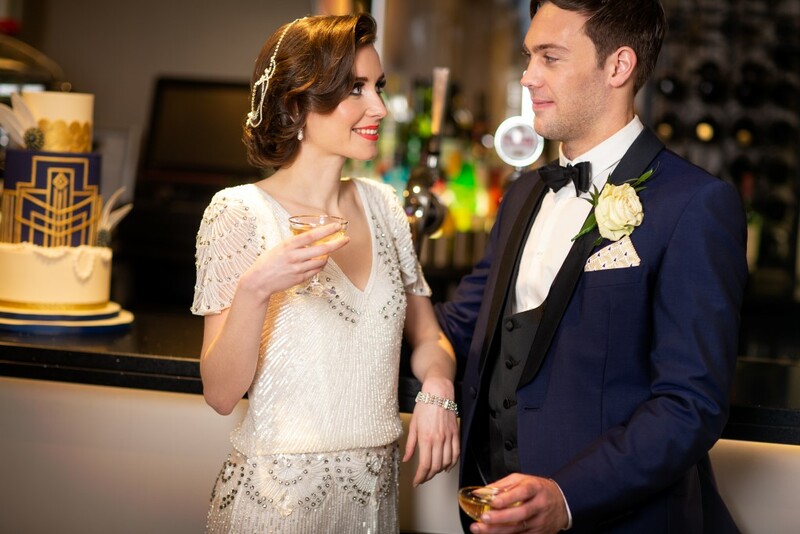 I worked with my friend and makeup artist Katie Poole to create an elegant and feminine look for them, setting their hair in soft waves and bringing out their eyes with a little smoke. 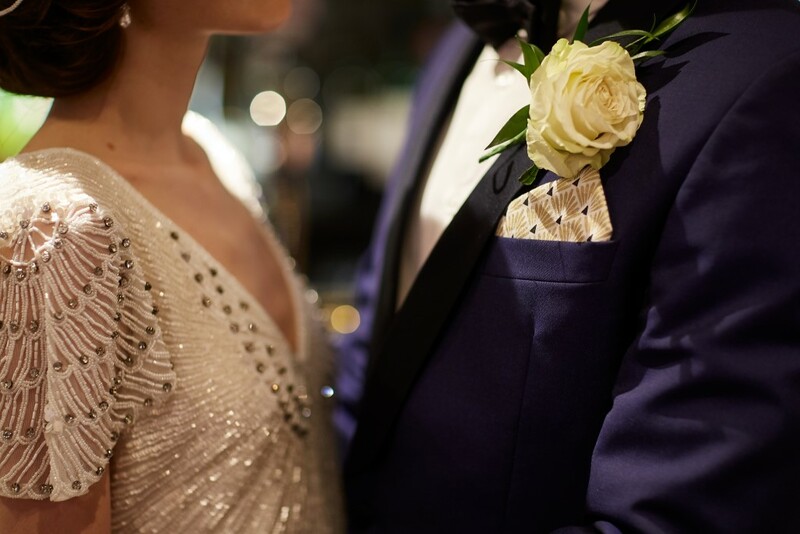 When their dresses and beautiful hair accessories by Dee Neicho were all in place; and when our dapper groom dressed by Anthony Formalwear arrived on the scene, we could have been right slap bang in the roaring 20s! 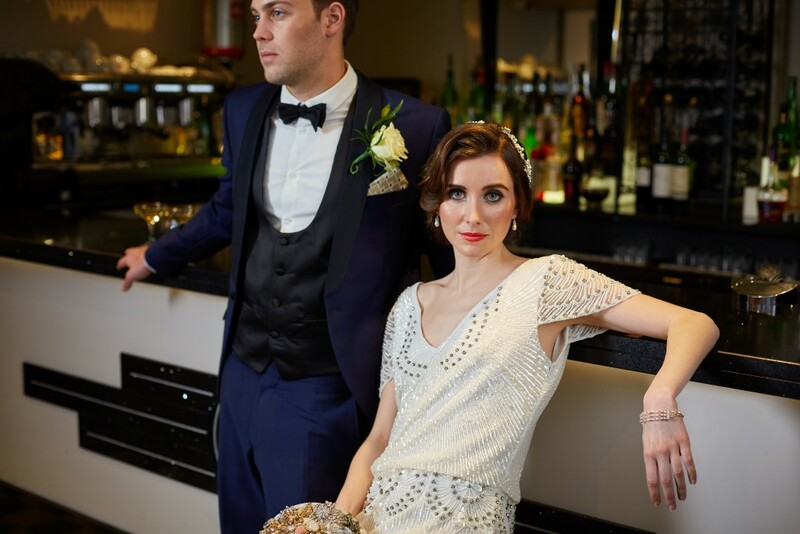 I wanted this shoot to have that Gatsby atmosphere in as many ways as possible, and that included outside the venue. 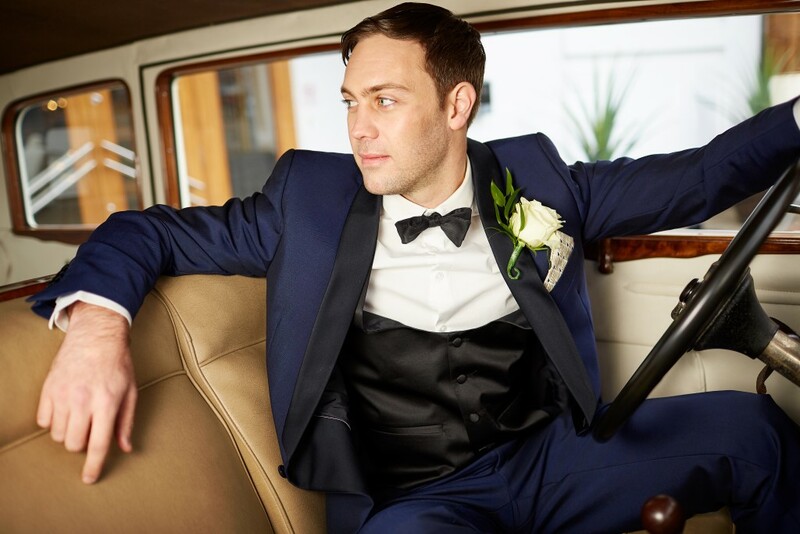 Arrow Vintage Cars loaned us a real wow of a machine: a beautifully sleek Pierce-Arrow Limousine that was once owned by US President Hoover. 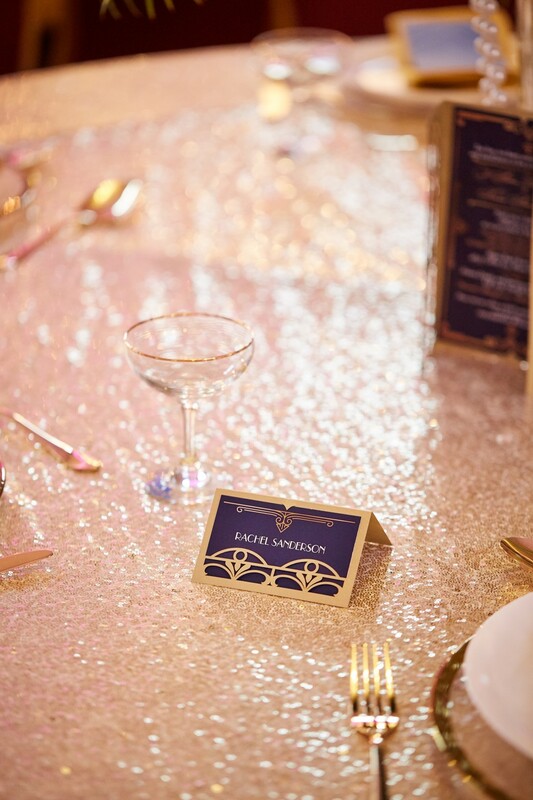 Inside the venue, we worked with an opulent colour palette of gold and peacock shades. 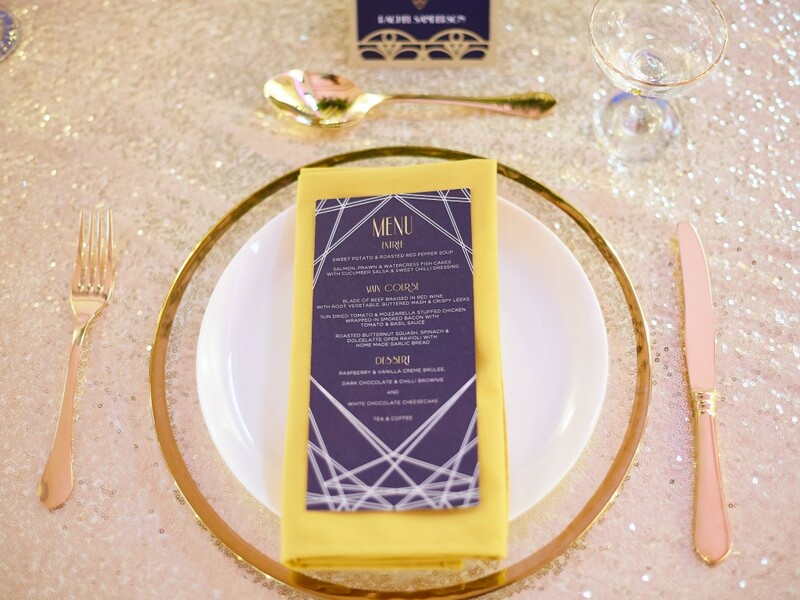 The styling and some of the supplier sourcing was done by the seriously talented and very lovely Laura of Rock The Day Styling, and Victoria from Party Squared. 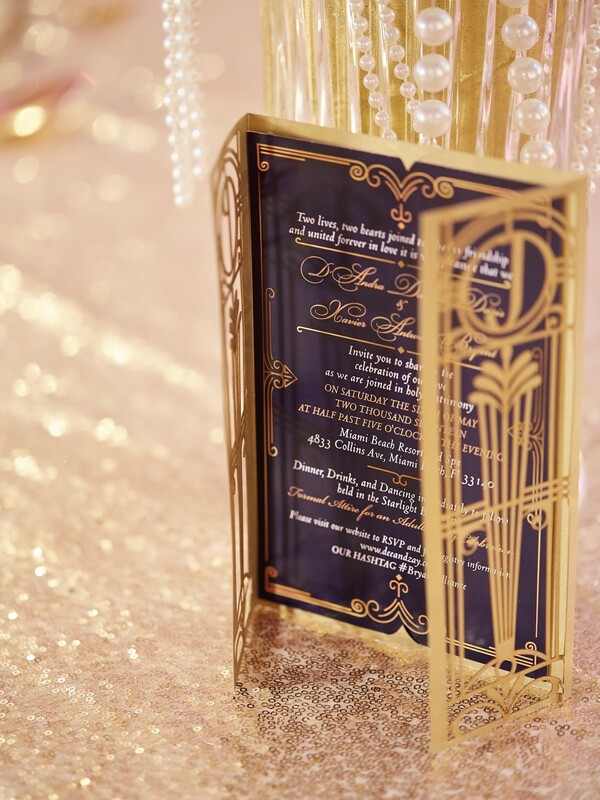 The stationery from Cartalia looked amazing with its laser cut art deco details, and it really popped against the sumptuous gold sequin tablecloths. 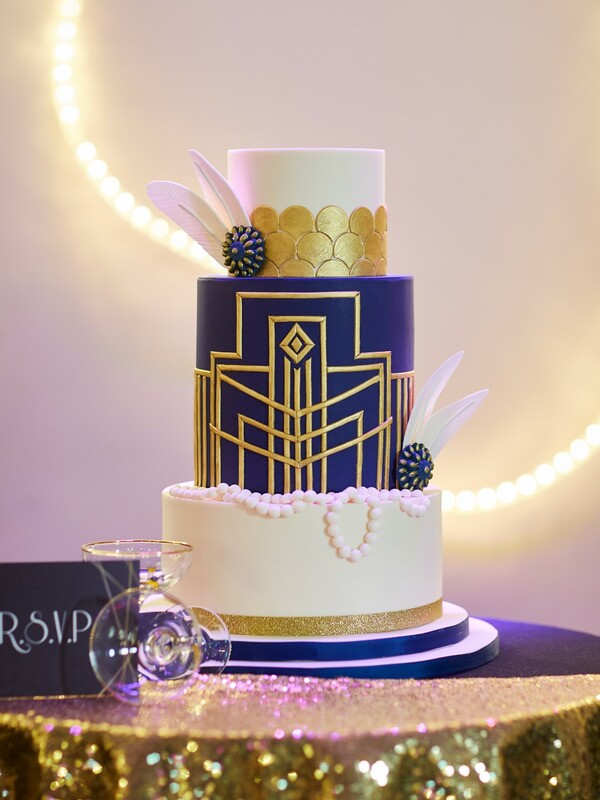 Pinkface Cakes outdid themselves with a three-tiered beauty in rich purple and gold, dripping with sugar pearls. 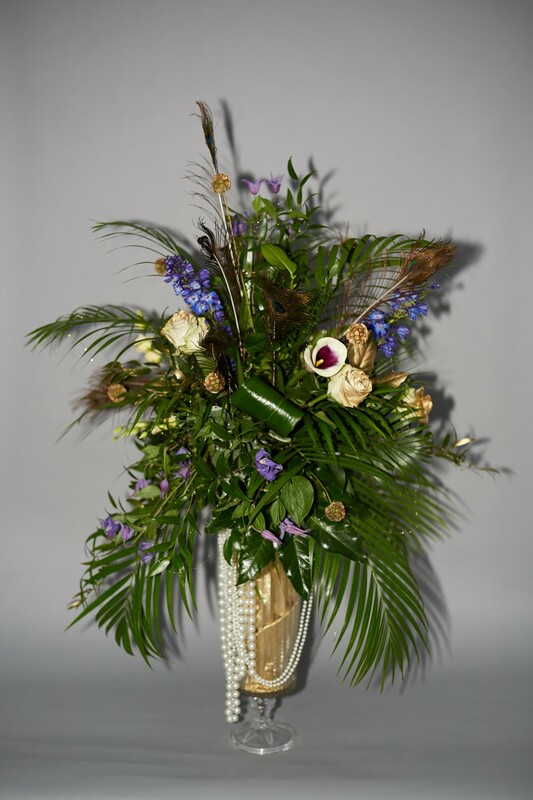 Pearls also looped their way through the floral arrangements from Courts of Rayleigh, which included lush ferns, orchids and peacock feathers – opulence galore. 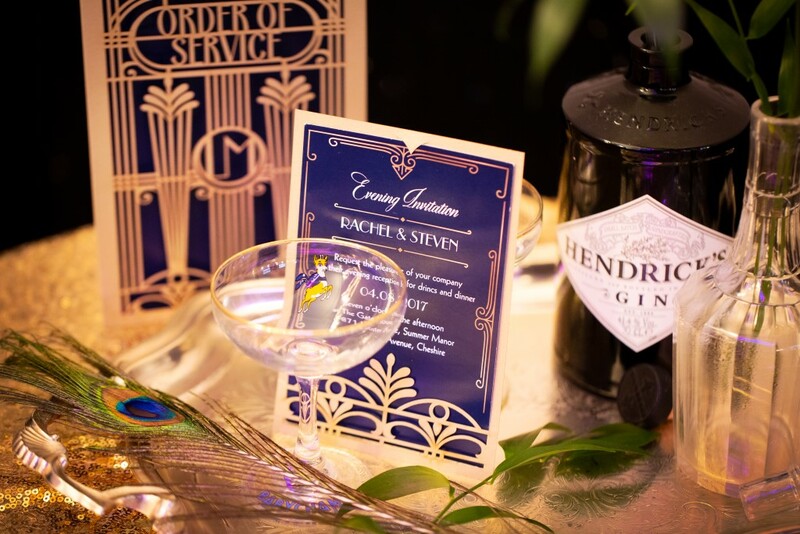 Rather than a traditional bridal bouquet, we opted for something a little different. 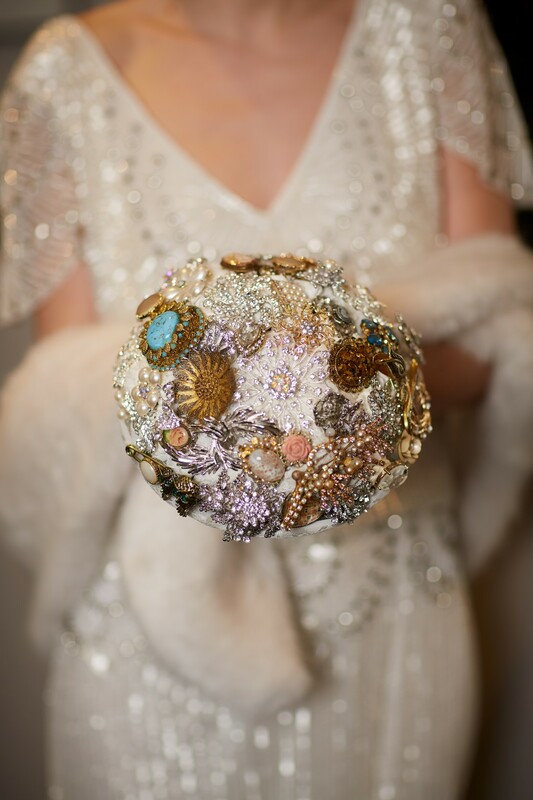 Blue Dove Weddings provided a beautiful brooch bouquet made from collected vintage pieces that glittered and sparkled as it caught the light. It was the perfect accessory for this look. 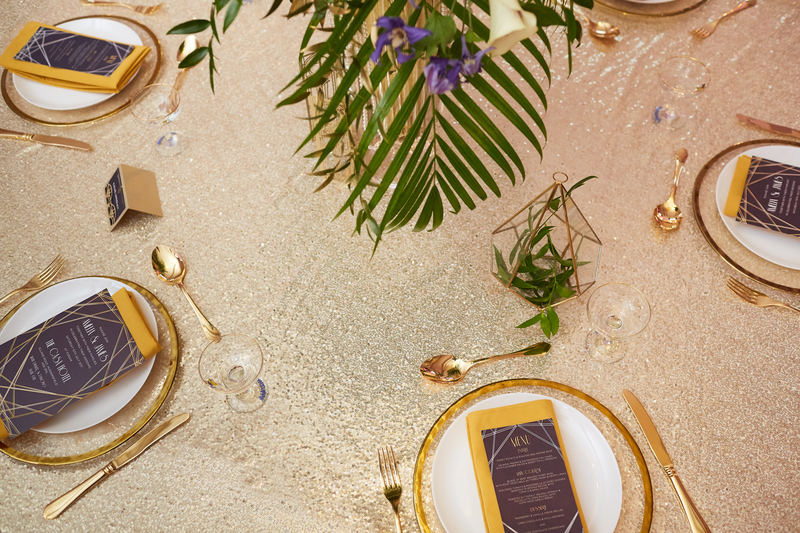 The team on this shoot were a dream to work with, and I’m so happy with how everything came together.